Hey salesforce freakies ! Salesforce evolves new features always. Recently introduced new lightning component called “lightning:listView”. That helps us to see all records according to list views of particular object on lightning experience, lightning communities and salesforce mobile App. In standard ‘lightning:listview’ component we can show just a single list view at a time, and to change that we need to edit again in code. 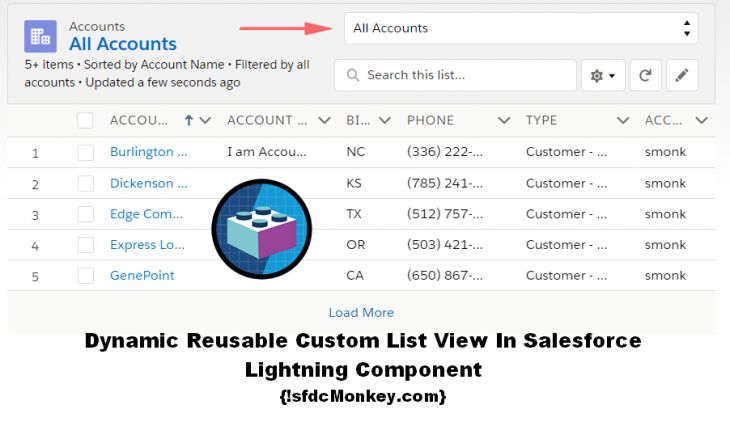 To make it more flexible and dynamic we have created a custom drop-down which will help us to change list view directly from lightning component output. I was facing an issue earlier , with lightning:listview. the list view is visible , but the record name hyperlink and inline edit is not enabled. Any idea why these two are not working?,any help is appreciated. thank you so much. copy pasting the above code with minor changes directly solved my issue. you are a gem. Hello! How do you get the selected values from the listbox?